We’ve all heard the saying 80% of sales come from the top 20% of brand (heavy) buyers (Pareto’s law). It turns out this thought process is flawed, with studies showing light buyers have a bigger impact on sales. And it gets worse in competitive product categories like FMCG, the 20% of heavy buyers are only responsible for 35% of sales. Light buyers are shoppers who purchase a product on average once a year. Heavy buyers are loyal and purchase products frequently. They respond to advertising and are active during promotion periods. But it can be challenging to increase the purchase frequency of the heaviest buyers as they’re already at capacity. 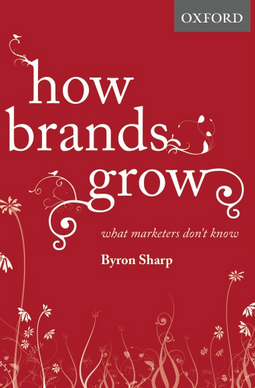 I’m reading Professor Bryon Sharp’s book from the Ehrenberg-Bass Institute on ‘How Brands Grow’. The book is challenging a lot of the things I learnt at university! Research from the Ehrenberg-Bass Institute recommends marketers focus on increasing the buying frequencies of light or non buyers. The reason for the focus is that a lot of brands are actually made up of mainly light buyers, who switch and become heavy buyers, and vice versa. As a result we see many brands running promotions, creating occasions and or extending their product range in attempt to increase the buying habits of light buyers. Professor Gerald Goodhardt’s 20:30:50 law challenges Pareto’s law, he states that the market is made up 50% of light buyers who are responsible for 20% of purchases, while the 20% of heaviest buyers are responsible for 50% of purchases. I feel these figures are closer to reality than Pareto’s law. Reaching all buyers, especially light buyers are vital for growth. While heavy buyers must not be ignored, the real opportunity lies with the light and non buyers. As I work my way through the book I will share other marketing theories/ insights.